Travel with us into the delightful healing forests of Japan. Discover the magical moss covered forests of Yakushima island and know about the volcano museum. Breathe in the deep greens of dense forests and soak in the crystal streams, waterfalls and hot springs scattered around. During the 1980’s Japanese researchers and scientists started discovering multiple benefits of being in forests and reconnecting with nature. 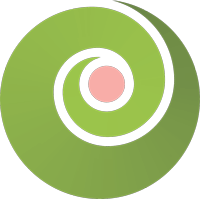 With the development of medical equipment related to natural and life sciences, this field has advanced even more. They have given us scientific proof on our intuitive understanding that nature heals. Japan as a country has established many healing forests in their country over the years. Designated nature reserves where people can go to experience the healing powers of forests. Japan is a technologically advanced world. Cities have become mazes of steel, concrete and silicon, swimming in a sea of electromagnetic waves. In this electronic age, some part of us still yearns for the freedom and comfort of nature. For many people, the answer lies in reaching out to the forests. Shinrin-yoku is a term the Japanese use to describe this practise of immersing oneself in the forest. Literally translated it means ‘forest bathing’. Allowing nature to cleanse the mind and spirit of negative thoughts and emotions. Reawakening your senses, rejuvenating your energy and adding strength to your healing ability. 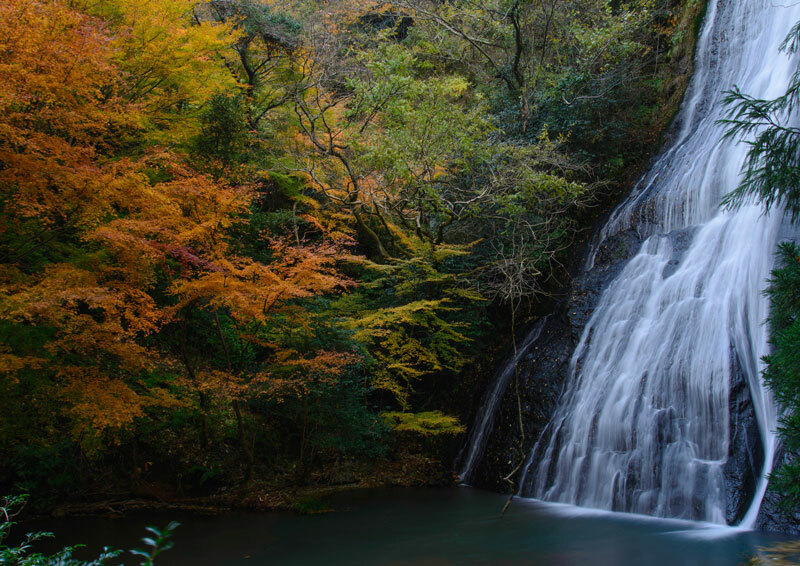 Given below is a hand picked list of some of the best healing forests of Japan. “A town of great natural beauty, clean streams and hot springs”, Kitago Town in Nichinan City is located in the southern part of Miyazaki Prefecture. The natural hot springs of 51 degreesC welling up from 800 meters below the ground are popular with visitors from both within and outside Miyazaki who refer to it as the “The Beauty Hot Spring”. Hanatate Park is famous for its 10,000 cherry trees and in spring, visitors flock from all over to gaze at the clouds of soft pink blossoms. 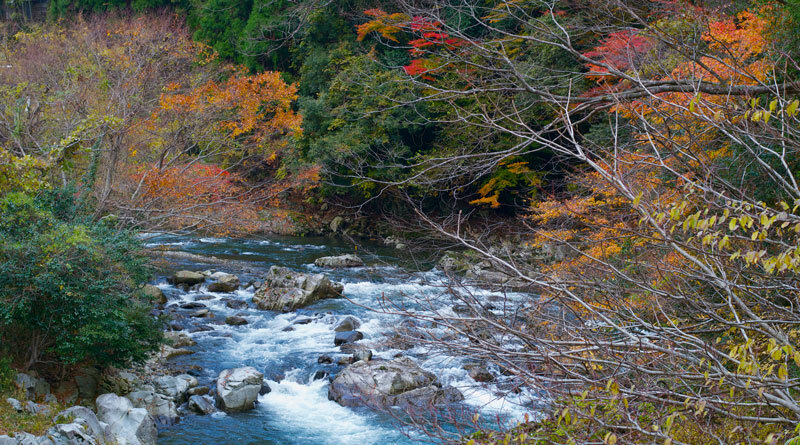 Located in the southeastern part of Fukuoka Prefecture with the Minou Mountains ranging to the south and the Chikugo River flowing in the north, Ukiha City has a rich natural environment. The Town of Iinan nestles in the highlands at an elevation of 450 meters. The sources of both the Hii and Kando Rivers are to be found in this region made famous by its long history of rice and vegetable production. With easy access to such a rich natural environment, the town of Iinan’s Forest Therapy programs offer a combination of nature, history and culture. 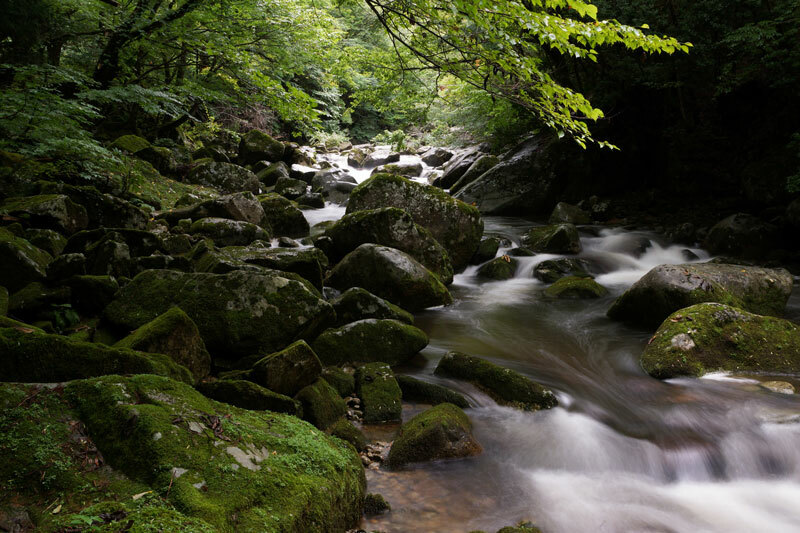 Along the forest therapy road in Chizu, in the Ashizu valley, flows one of the best streams in western Japan. It is situated in a forest of cedar and hardwoods. The valley is magnificent in all the four seasons and has something new to offer every time you visit. 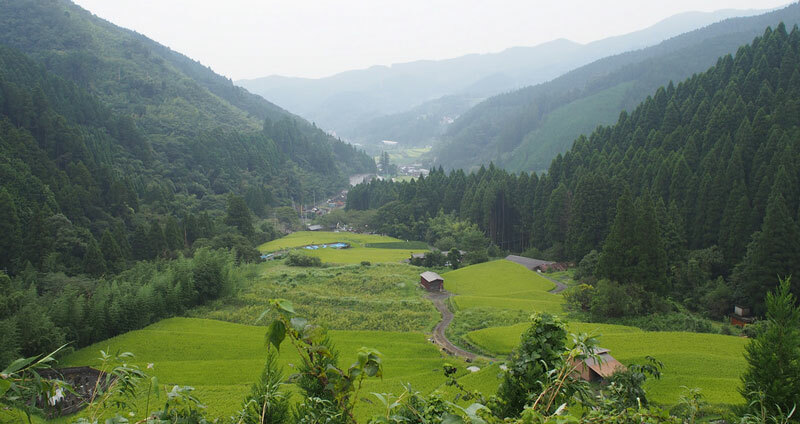 The valley stretches to the Chugoku Nature Trail, encircles the Mitaki Dam and continues on to the upstream river valley. 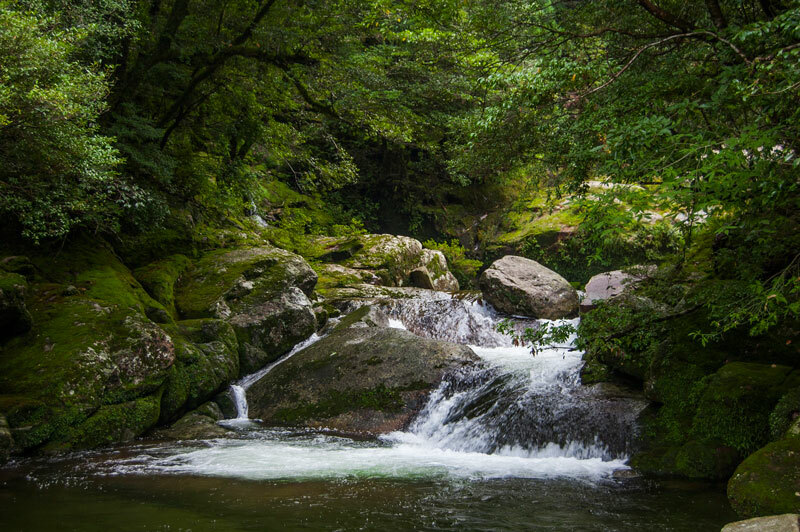 Surrounded by towering mountains with an elevation of over 1000 meters, such as Hyonsen, the highest peak in Hyogo Prefecture, the City is full of lush greenery as it is part of the Hyonosen-Ushiroyama-Nagisan Semi-National Park and the Onzui-Chikusa Prefectural Natural Park. With towering mountains, primeval forests and clean sparkling lakes, it has an undulating terrain surrounded by high 2,000 meter mountain ranges rich in volcanic rocks such as green tuff, andesite, diorite and basalt, indicating the intensity of past volcanic activity. It is known as a “volcano museum”. The therapy roads often take you to vantage points where you may find a sea of clouds under your feet. The primeval forest of Shiga Kogen also has circular loops around emerald lakes reflecting the forest green. We hope this article inspired you to go out and spend some time in nature. As part of our project we are identifying and marking healing forests around the world. Quiet spaces in nature that one can visit without feeling unsafe. You can check out the map so far and even recommend a nature trail to be added to this map. If you haven’t already, you can subscribe to our monthly blog posts here. We are a small group of friends trying to help people reconnect with nature. Our aim is simple. Helping people heal. Helping forests heal. To know more about us and join us as a fellow volunteer visit this link. May the forests be with you. 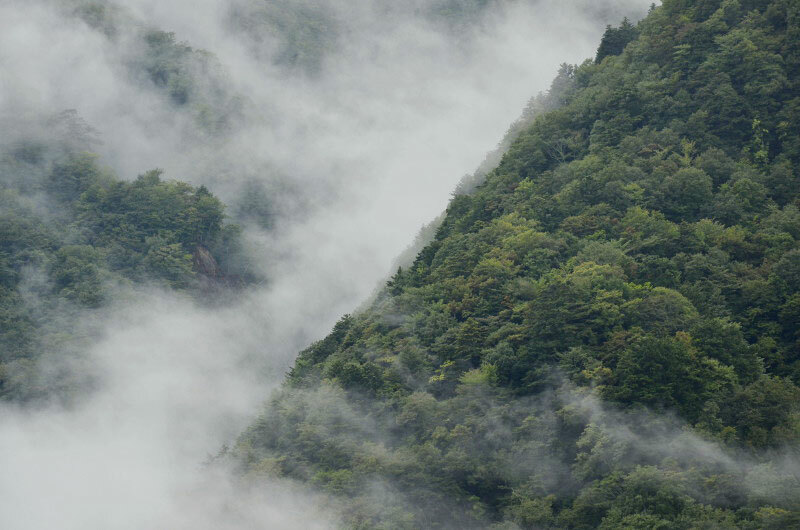 KUMANO – 熊野 from Mathieu Le Lay on Vimeo. Trees healed me. My company fell. My beloved husband went away. I stayed alone with children and debts. The trees took care of them and started talking. I asked them to cuddle, teach others how to cuddle, wrote a book about the fact that they are aware. Thank you for sending me these files…. I’m very excited to announce to the group that I, together with my associates and nature friendly friends and advocates will spearhead a group that will establish the first HEALING FOREST here in our beloved city of Davao, Philippines! We will move fast and swift for us and the next generation to enjoy and take advantage of the universal healing method of the FOREST! To GOD be the glory as he is always with us in this undertaking… thank you very much and we shall update the group of our engagement! 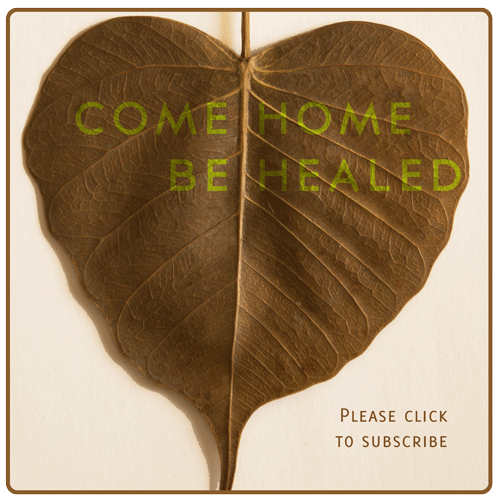 If you have a personal story of healing through nature that you'd like to share with a larger audience, please connect with us.